Updated Saturday, April 15, 2017, 9:12 a.m. EDT: A federal judge has blocked the executions of six men in Arkansas, throwing into doubt whether the state will be able to carry out the executions before the expiration date of a controversial drug used in lethal injections, according to the New York Times. The ruling by Federal District Judge Kristine G. Baker in Little Rock, Ark., comes less than 24 hours after a circuit judge in Pulaski County, Ark., issued a temporary restraining order to halt the executions. Baker’s ruling applies to nine death row inmates, but of the nine, one prisoner’s execution had not been scheduled and two others had received stays of execution. 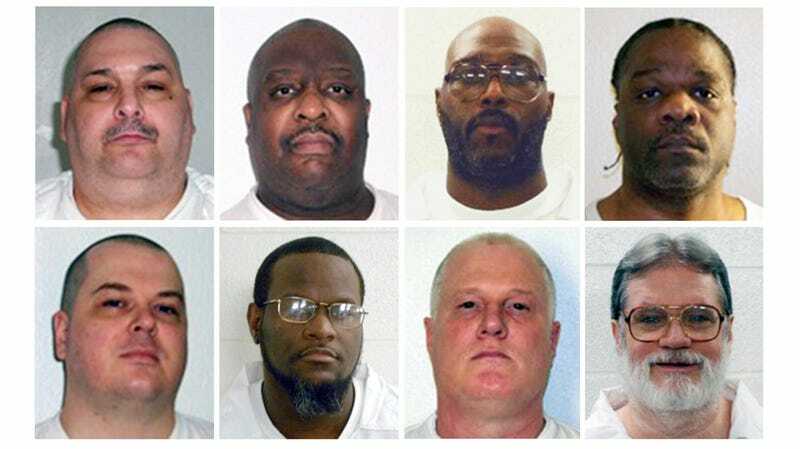 The executions of the remaining six were set to begin Monday night and continue over the next 10 days, an extremely speedy schedule that had drew criticism from across the nation. A circuit judge in Pulaski County, Ark., has issued a temporary restraining order that brings to a halt, at least for now, the executions of all eight men previously scheduled to be put to death by the state during the month of April. Judge Wendell Griffen issued his order after the Arkansas Supreme Court issued a stay that blocked the execution of Bruce Ward, who was to be put to death on Monday, and Arkansas Online reports that the state attorney general’s office said it would seek to have Griffen’s order overturned by Arkansas’ high court. An emergency hearing on the matter is scheduled in Griffen’s court Tuesday morning. As previously reported on The Root, the state of Arkansas was moving quickly to pull off eight executions in 10 days during the month of April as it tried to beat the clock on an expiring supply of a controversial sedative used during the lethal-injection process. Midazolam is a sedative that is supposed to render inmates unconscious so that they don’t feel pain during the process, but during several executions in which the drug was used, inmates were seen writhing in pain and gasping for air as they died. Medical supplier McKesson sold the state vecuronium bromide. In a statement Thursday night, McKesson said it complained to the state after learning that Arkansas planned to use the drug for lethal injections. The state said it would return the drug, McKesson said, and the company issued a refund, but the drug was never returned. McKesson filed a complaint in Pulaski County on Friday in an attempt to get the drug back, and Griffen issued his restraining order about 30 minutes after the complaint was filed. Judd Deere, who is a spokesman for Attorney General Leslie Rutledge, criticized Griffen for hearing the McKesson complaint. The questionable drug protocol was just one of many issues with the scheduled executions. According to a report put out by the Fair Punishment Project at Harvard Law School, five of the eight men set to be executed by the state suffer from a serious mental illness or intellectual impairment. One was only 20 at the time he committed his crime, had suffered a serious head injury and has an IQ of 70. Another is a paranoid schizophrenic who believes that he is on a mission from God and sees his deceased father as well as reincarnated dogs around the prison. A sixth man was burned, beaten, stabbed, raped and pimped out by his mother to various adults throughout his preteen and teen years. As for the other two inmates, there is no evidence that their attorneys ever conducted even the most basic investigation to find out if their clients had any mental illnesses or disabilities. While Griffen’s ruling offers a temporary reprieve for the eight men, it does not solve the greater problems of injustice involving their cases.